Traditional landscapes do not give our native birds and butterflies what they need in the way of food. The typical plants we choose for our yards like grass, hostas, daylilies, boxwoods, roses, vinca and most of the traditional favorites are foreign plants to our wildlife. Our native wildlife needs the berries and bugs that thrive on native plants. The native plants of our region have evolved in this area for over 10,000 years. The bugs and berries that grow on native plants are the day to day food source that sustains our bird population. All the birds of our region rely on bugs for protein. 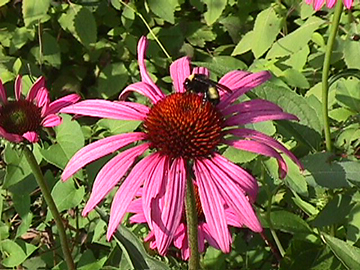 The bugs live in and on the native plantings. The ecosystem in our region is based on plant life. All the creatures here need the native plants, insects, moles/voles as a base for their diet. 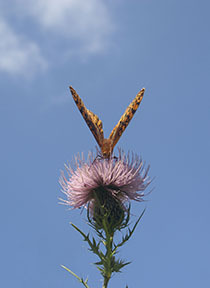 A butterfly garden is an easy way to attract the many species of butterflies common to the Chicagoland area. These colorful gardens are full of native, nectar-rich plants that provide food for butterfly larvae and adults. They can be large or small, and adapted to almost any soil conditions, so get planting, and watch the beautiful critters appear! Plants that attract butterflies should be planted in full sun, and ideally in a sheltered location (butterflies don't like to fight the wind). Plan your garden to have colorful blooms from early spring to late fall. We've put together a colorful four page "How-To" Natural Landscaping Guide with suggested native plants, organized by plant height. Avoid chemical fertilizers or pesticides, since butterflies and other wildlife are extremely sensitive to them. Besides, native plants don't need them! To learn more about backyard conservation, consider getting involved with the Conservation@Home Program. This program recognizes, educates, and encourages landowners who want to practice environmental stewardship from their own backyards. For more information, contact Jim Kleinwachter at The Conservation Foundation at 630-428-4500, Ext. 115 or email him. Need professional help? Visit our Conservation@Home Guide to Professional Resources.